In this post I'll show how you can invoke Azure Functions from SQL in your on-premise SQL Server database. But first, some context. Serverless functions are the most reusable software entities that ever existed. If you doubt that, just take one look at the Azure Functions Triggers and Bindings page. Functions can be called into service by everything from an HTTP request to a queue message to the passing of time. And yet, as versatile as all these triggers are, sometimes you might desire to invoke functions-in-the-cloud from your local enterprise. And in the local enterprise, databases are king. 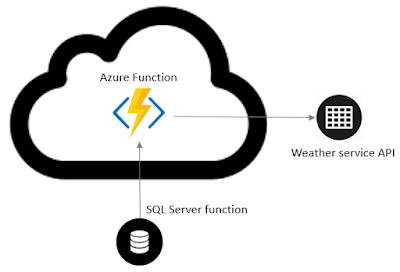 So, let's imagine you have your local SQL Server database but you want to integrate that database data with something in the cloud: specifically, you'd like to invoke Azure Functions. 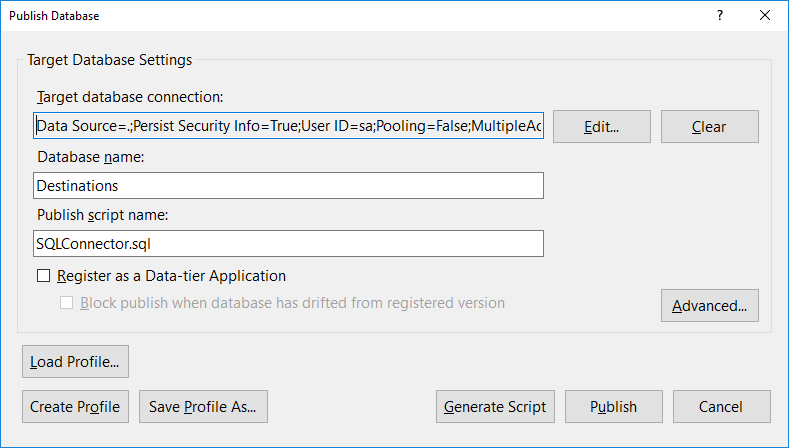 Ideally, you want this to be as accessible as joining two tables in a SQL Query; in fact, SQL queries would be the perfect place to invoke your Azure Function. The SQL function weather(latitude, longitude, property) is in turn invoking an Azure Function. That function is retrieving the weather from weather service DarkSky. The data could just as easily have come from a cloud database using the same pattern. To return weather, you need a source for meteorological data. I'm using DarkSky.net, which has an approachable JSON API, a lot of good data, and a generous allocation of 1,000 free API calls per day. All that's left then is to write our function, which will be making an https call to DarkSky.net to retrieve the weather. To repeat this yourself, you'll need to register with DarkSky and get your own API key. body: "Missing parameters: lat, long, prop"
temperature: values like 59.5 or 17.
icon: values like cloudy or rain or partly-cloudy-day. There is in fact a great deal more data in the Dark Sky result set that we could enable, but this will suffice for our example. Here's a diagram of how the pieces connect. The CLR SQL Server function is invoked by SQL queries, and it invokes our Azure Function for weather via HTTP. The Azure Function in turn retrieves and returns weather data from the weather API. Let's take a look at the code to our CLR function. To work on CLR user-defined functions, you'll need to get acquainted with SQL Server data types like SqlString, the use of yield to return record values, and Fill Method functions to package enumeration results. You can read up on that here. // Perform a GET url and return the response string. // Extension to WebClient that has a Timeout property. After building this project, it can be published to a SQL Server database by right-clicking the project and selecting Publish. 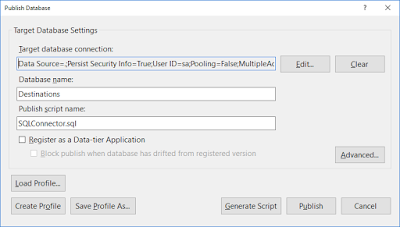 This will give you a dialog for selecting a target database to publish to. Now, our example is a simple one: the Azure Function is only returning a single column of data per call, and that isn't particularly efficient. However, CLR SQL Server functions are capable of returning entire rowsets of data so it's entirely possible to be returning multiple columns and mulitple rows. The possibilites are endless. If you've been paying attention to this exercise, you may be asking yourself if the Azure Function was really a necessary component in this exercise. After all, the CLR SQL Server function is doing a web request, and the weather data is available in a web API. While it's true in this specific case that we could have bypassed the Azure Function, that would miss the broader point: functions are versatile, and they are gateways to access your assets in the cloud--such as a cloud database or other data repositories. 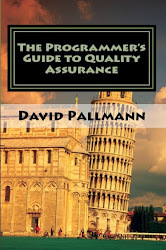 You want functions in place wherever the pattern of processing or source of data might conceivably change. For exampe, maybe you want the weather data cached for a certain amount of time to avoid exceeding an API threshold; or perhaps you'll eventually change data providers. Your function should worry about those details and nothing else should have to. Building your solution with functions in the processing chain gives you maximum flexibility. Down the road when requirements and technologies change, the use of functions will preserve your ability to quickly pivot should you need to without being disruptive. It's gratifying to see how strongly cloud computing is now being embraced, but enterprises will continue to have local systems and assets for a good long time, along with the need to connect them to applications and data in the cloud. 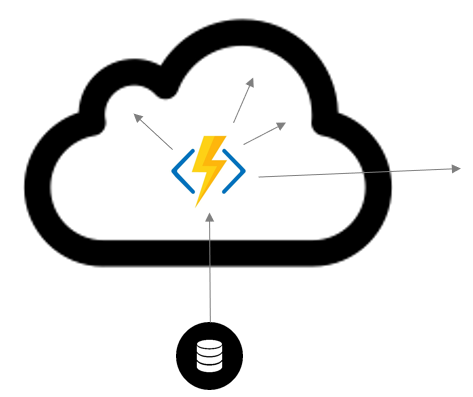 Azure Functions make excellent gateways to cloud assets from the enterprise, but enterprise systems need natural ways to access these functions. The technique we looked at today allows SQL Server databases to query Azure functions in a natural way.